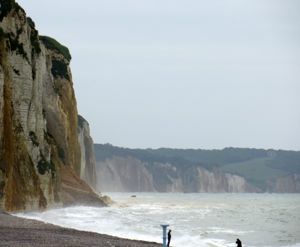 About 200 kilometers (125 miles) from Paris, Dieppe is the closest beach/spa to the French capital. Framed by white chalk falaises (cliffs), the harbor of Dieppe, 192 km (119 miles) northwest of Paris (map), has seen a lot of history. From here, French navigators set out to explore the shores, bays and islands of Canada in the early 16th century. 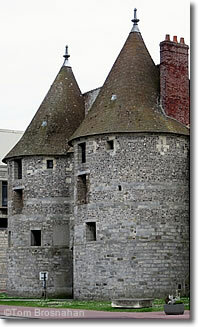 Later, between 1663 and 1673, 770 unmarried young women passed through Dieppe's medieval Porte des Tournelles and embarked for Canadian settlements to build the colony's population. Called Les Filles du Roy (The King's Daughters), they were sent by King Louis XIV. Centuries after that, in 1942, Canadian commandos stormed ashore here in a valiant but doomed attempt to reverse the tide of Nazi hegemony in Europe. Dieppe's favorite son—or at least its most colorful one—was Jehan Ango (also called Jean Ango), a 16th century privateer and good friend of King François I. He commanded up to 70 ships and successfully took on the Spanish and the Portuguese. One of his captains was the Italian Verrazano, who eventually went to New York. Today Dieppe is a popular seaside resort and fishing port, selling and serving some of the best, freshest seafood in France. Pleasure boats are moored near fishing boats in the harbor, and seafood restaurants and cafés line its shores. Dieppe's pebble/shingle beach is broad and long, and slopes gradually into the sea. It's the closest beach to Paris (2.5 hours by car or train). Dieppe is also known for its spa and baths, which over the centuries have attracted royalty, celebrities, and just plain us folks. Above, Atmospheric falaises (cliffs) and beach, Dieppe. Below, The gate through which Les Filles du Roy left for Canada.